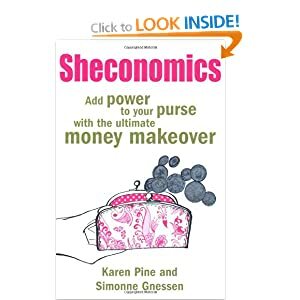 Sheconomics is all about women and personal finance. Packed full with case studies, reallife stories and experiences it aims to be a no nonsense easy to follow financial guide for women. It contains tips on taking emotional control of your finances, sorting pensions, investing, planning and living within your means. I like this book because it is very straightfoward to read, it condsiders issues relevant to women without implying we are airheads who just buy clothese and eat chocolate) and it is serious and responsible without being ‘heavy.’ Case stories abound and these always make tips seem doable and situations seem real and this book uses them very well. I love chapter 9 which follows a day in the life of a top shecononist – it’s brilliant! oPre packed lunch, cost free yoga, opening the bills straightaway, using oranges form the market in the juicer etc. we coould all do with a day like that. An excellent book highly recommended . Whether you are looking out for your family’s well being with the best private health care or wanting to save for the holiday of a lifetime this book helps you sort your finances in your own way.